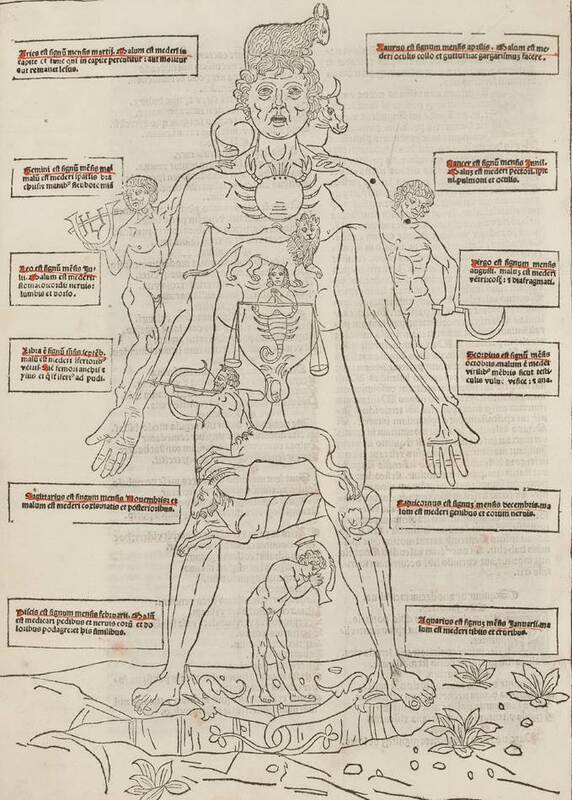 Medieval and renaissance medical theory incorporated astrology, and stated that health and disease were affected by the movement of the stars and planets. This diagram shows which parts of the human body were believed to be related to which of the 12 signs of the zodiac. Aries (the ram) is at the top of the head and Aquarius (the water carrier) is at the feet. 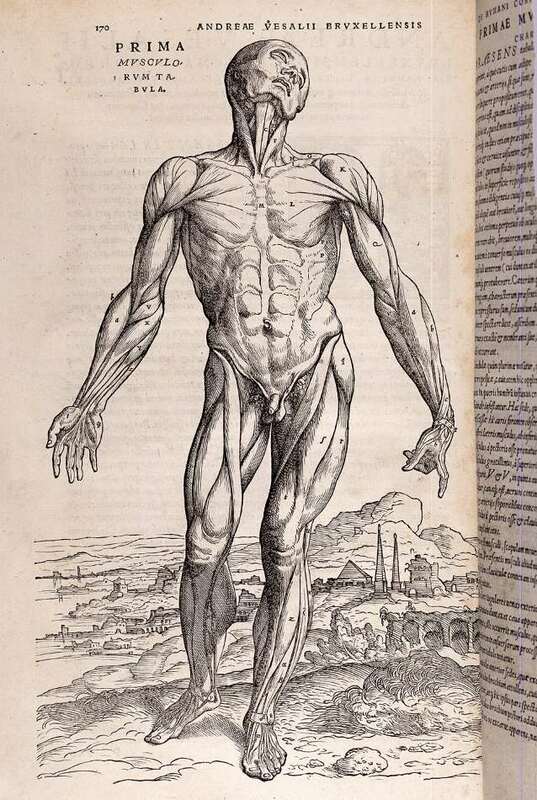 The book De humani corporis fabrica (‘On the fabric of the human body’) by Andreas Vesalius (1514–1564) is probably the most famous medical book in history. Its seven chapters describe and illustrate the anatomy in previously-unknown detail and accuracy. This dramatic woodcut shows the muscles of the male body, with a typical background showing the Italian countryside. Uroscopy – the examination of urine – was one of the principle diagnostic techniques that were available to physicians for hundreds of years, until recent centuries. 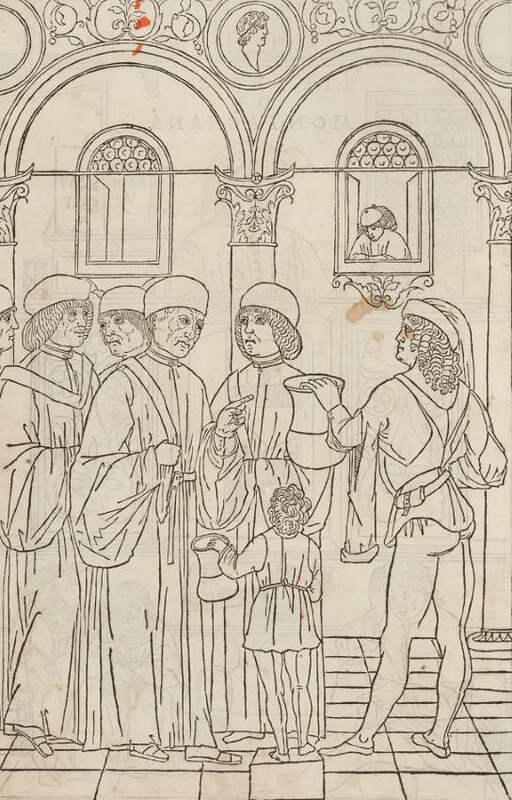 In this illustration, a patient on the right holds a urine sample in a glass flask, and a physician points his finger and gives a diagnosis. 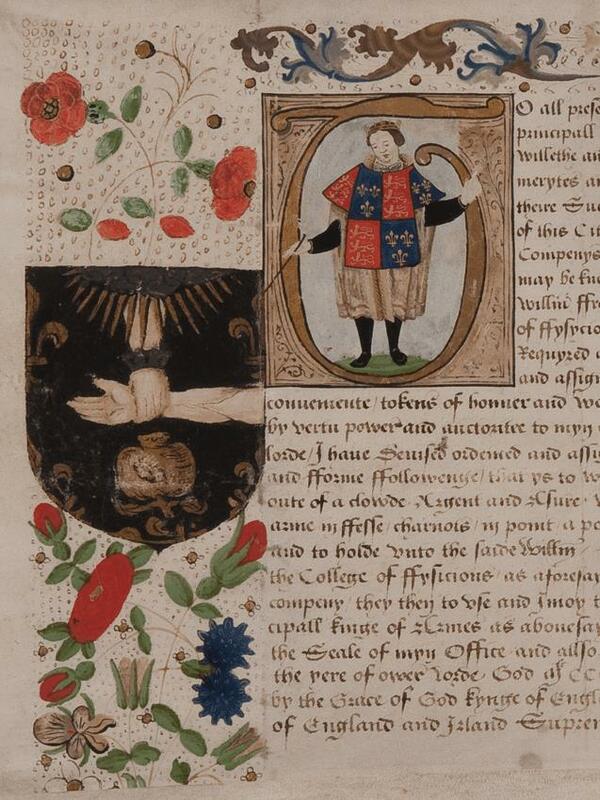 The coat of arms of the College consists of a blue shield with gold borders, a gold pomegranate and an outstretched arm with a hand emerging downwards from a golden sun to take the pulse. The sun’s rays indicate divine approval for the practice of physic. 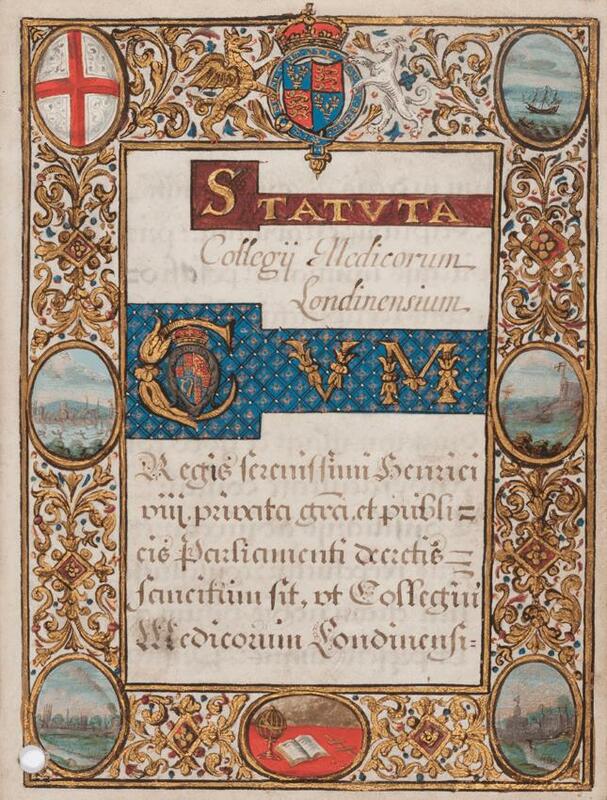 This is the first volume of the minutes of official proceedings of the Royal College of Physicians of London, known as Comitia. 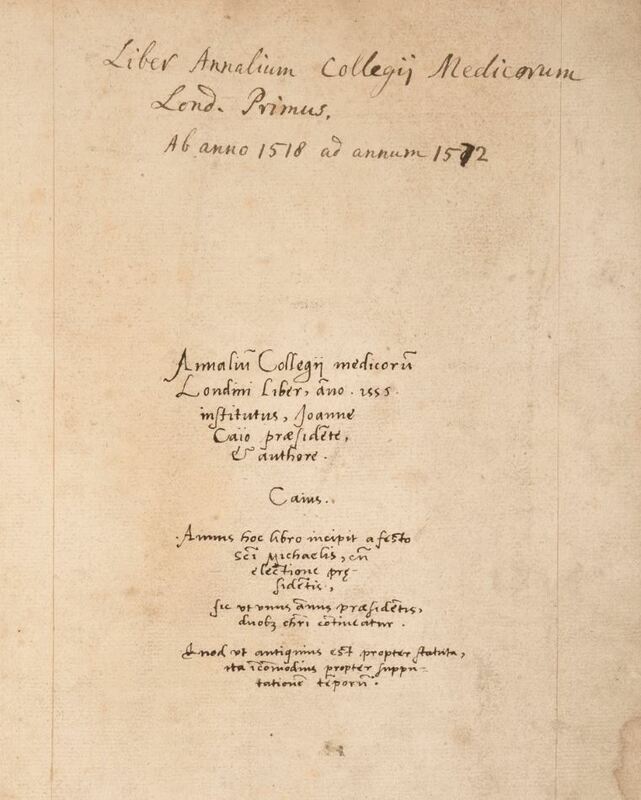 It was handwritten in 1555 by the president at the time, John Caius (1510–1573), from earlier records dating back to 1518. Now an annual general meeting, this official committee continues to meet today. 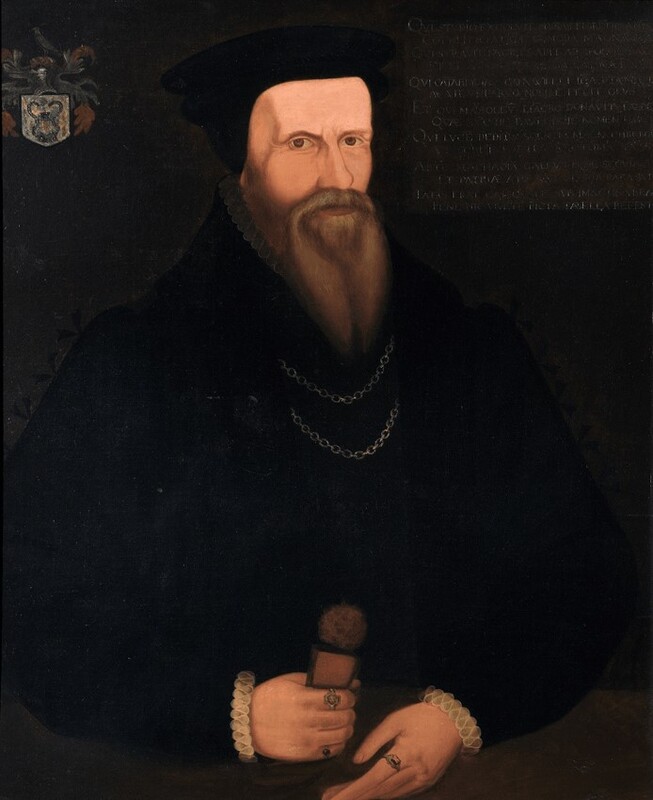 John Caius, who was president of the College between 1555 and 1560, established many of the administrative processes and ceremonial rituals that are still used today. 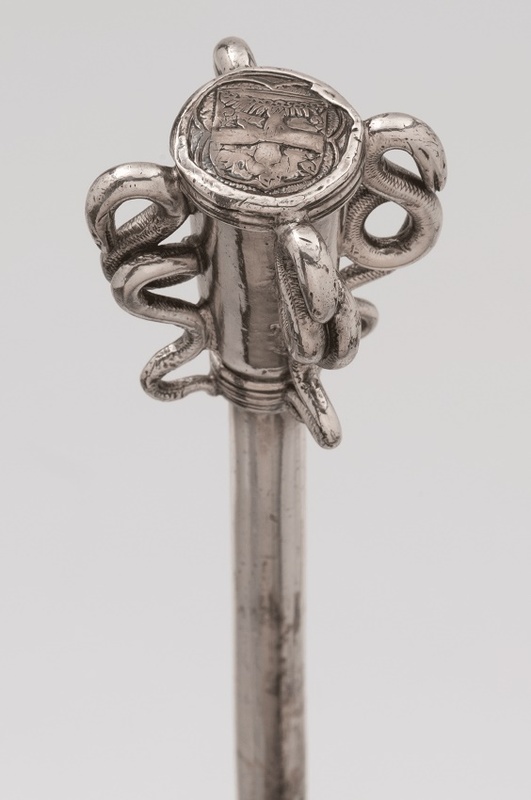 John Caius introduced this key ceremonial object, the caduceus, when he was president of the College. Caius explained that ‘[the caduceus] indicates that the President ought to rule with moderation and courtesy, unlike those of earlier days who ruled with a rod of iron’. This was the cover of the first set of bye-laws that were produced for the new College. It was commissioned by John Caius, who was the College’s president at that time.